The Cancer Treatment Centers at New Jersey Urology offer radiation therapy and advanced therapeutics in a safe, state-of-the-art environment for the most effective cancer treatment. NJU physicians are at the forefront of advanced treatment techniques, including minimally-invasive robotic and laparoscopic surgery for urologic conditions. Urologic cancers are amongst the most common types of cancers today. The team of urologists at NJU offer cutting-edge diagnostics and treatment at our private Cancer Treatment Centers. NJU physicians are engaged in a variety of research programs to evaluate new drugs, therapies, and treatments with the potential to find new cures for urologic disorders and diseases. The urologists at NJU are experts in the latest in surgical and non-surgical techniques for the treatment of stone diseases of the bladder, kidneys, and ureter. The physicians at NJU specialize in the treatment of women’s urinary health conditions, including overactive bladder, pelvic floor conditions and more. A physician who specializes in urology, or urologist, diagnoses and treats diseases of the male and female urinary tract as well as diseases affecting the male reproductive system. Urinary incontinence – or the loss of bladder control resulting in involuntary urine leakage – is a common problem that affects more than 33 million Americans. 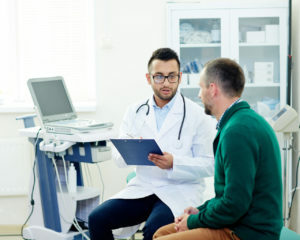 The physicians at NJU specialize in the treatment of men’s health conditions, including enlarged prostate (BPH), erectile dysfunction, male infertility and more. At NJU, our fellowship-trained physicians specialize in offering comprehensive services to women living with disorders of the female pelvic floor.